As you may have heard, eating brunch in Portland, Oregon is an experience. Actually, most meals in Portland are an experience. The people of Portland take lots of pride in their amazing food and the ingredients within their food. 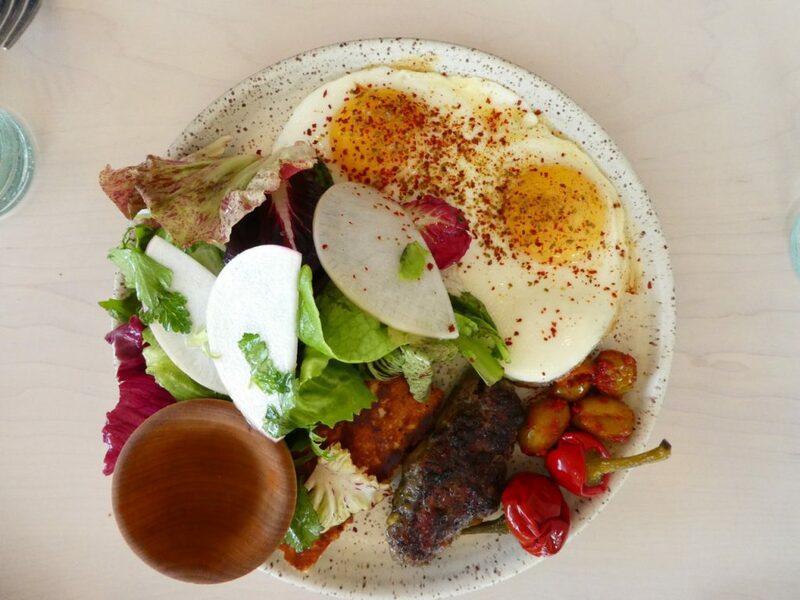 It’s a land of deliciousness, and Portland brunch is not to be missed out on. There are just so many brunch places to choose from, each of them an individual delight. 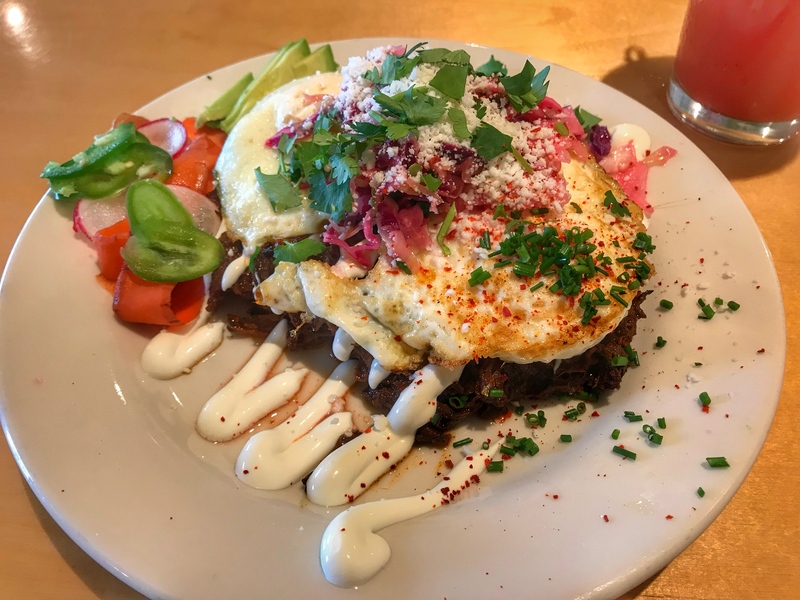 Aside from the outright awesomeness of the food served up, there are a couple of other factors that add to the Portland brunch experience. Not only do these restaurants take pride in their food, but they take pride in their appearance. Most of the brunch places I’ve visited are cool and cute. Portland is absolutely stuffed with restaurants and shops decorated in a very rustic fashion. Although eating brunch in Portland is rather enjoyable, there’s also a bad side to this experience. You may or may not have heard jokes about Portlanders waiting ridiculous amounts of time, just to eat Sunday brunch. I’m here to tell you that this is absolutely true. 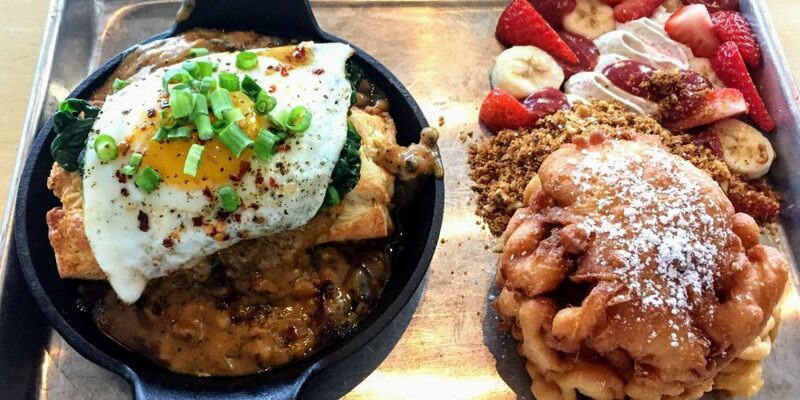 Brunch in Portland is incredibly popular due to how delicious it is. For that reason, the lines are always pretty long, especially at more well-known places. Even when the wait for Portland brunch is multiple hours, Portlanders stick it out for a tasty meal. If you’ve got nothing to do on the particular day of your brunch, then that’s fine. If you need to be somewhere after your Sunday brunch in Portland, then there’s a problem. All of these things are key parts of the Portland brunch experience that is often so good, but sometimes so very aggravating. 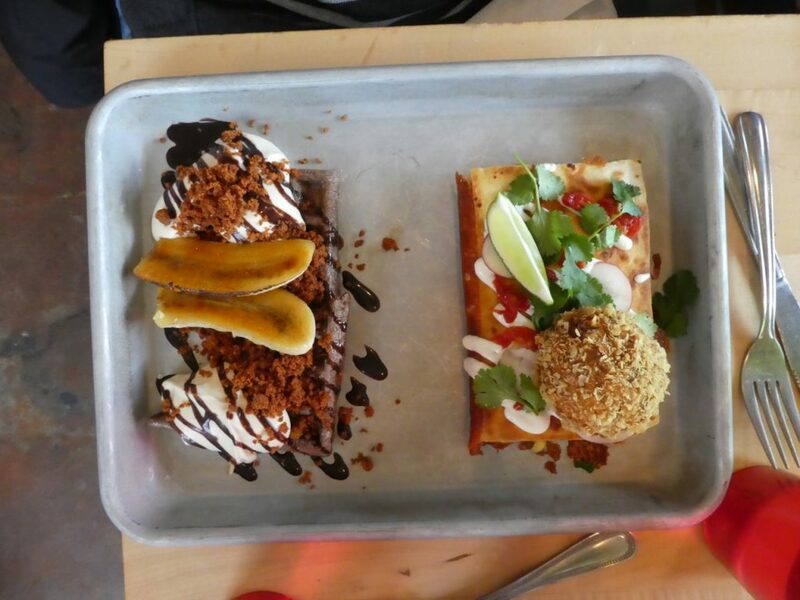 If you’re a local to the area, it’s likely that you’ve been to Screen Door brunch, or you’ve walked past it. You’ve probably also seen the ridiculously long line that goes out the door, collects in a mass on the corner and goes on down the street. Although they are a full-time restaurant that serves breakfast, lunch, and dinner, their weekend brunch is very popular. My mother took me on a little brunch date to the Screen Door a couple of years ago. Many people waiting in the cold outside were highly envious of our ability to waltz right in, due to our reservation. Of course, the line for the Screen Door isn’t too bad. It looks slightly worse than it actually is because the waiting area inside simply isn’t that big. Other than that, the staff does a good job of getting hungry people in and satisfied customers out. The seating area inside was slightly cramped, but I couldn’t complain. How else were they supposed to fit in all those eager customers? Besides, it wasn’t that bad. The restaurant was decorated nice and smelled of delicious food. We picked up our menus, stirred by the amazing smells all around us. I indulged in the hot chocolate pictured above. 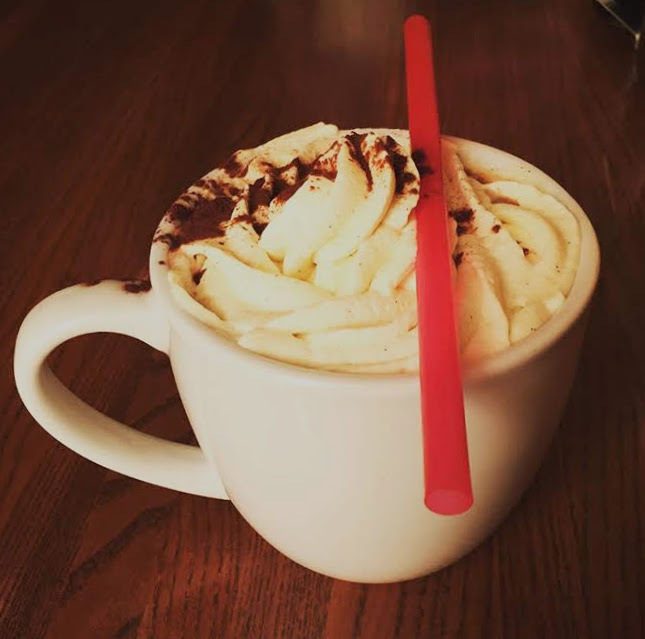 It was the best hot chocolate I’ve consumed in my life, mainly because of the fantastic homemade whipped cream. The Screen Door has a great number of delicious menu items, including biscuits and gravy, chicken and waffles, and a whole slew of other amazing foods. It was very hard for my mother and I to decide on what we wanted, and I eventually settled on the Cathead Biscuit Sandwich. They call it that because it’s made with a biscuit “the size of a cat’s head.” Sure enough, my meal arrived, and it was gigantic. The meal I had at brunch that day was the largest amount of food I have ever eaten. I just kept eating because it was so good. 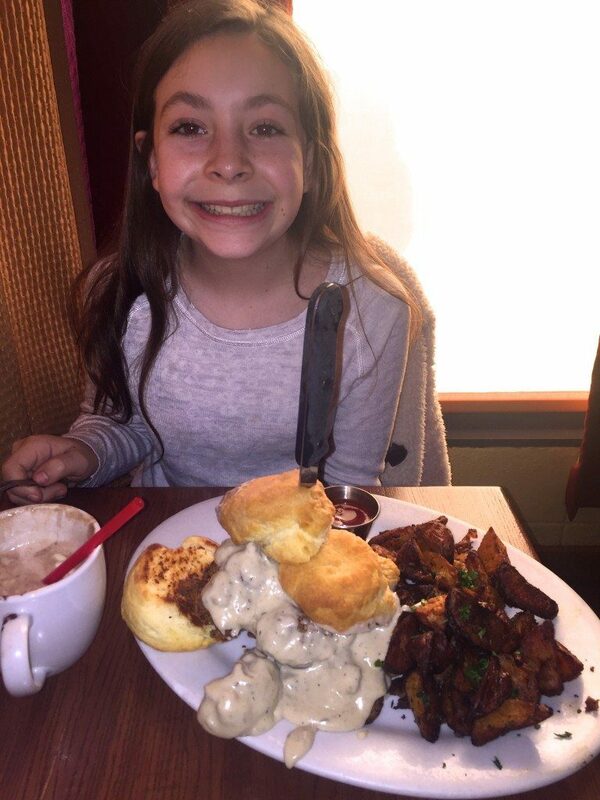 As it turns out, that much food is too much for a short, tween girl’s body to handle, and you can probably guess what happened next. Has anyone else eaten so much that they puked? It was absolutely worth it, and I still had some leftovers. To sum it up, I was very happy with my Sunday Portland brunch date. 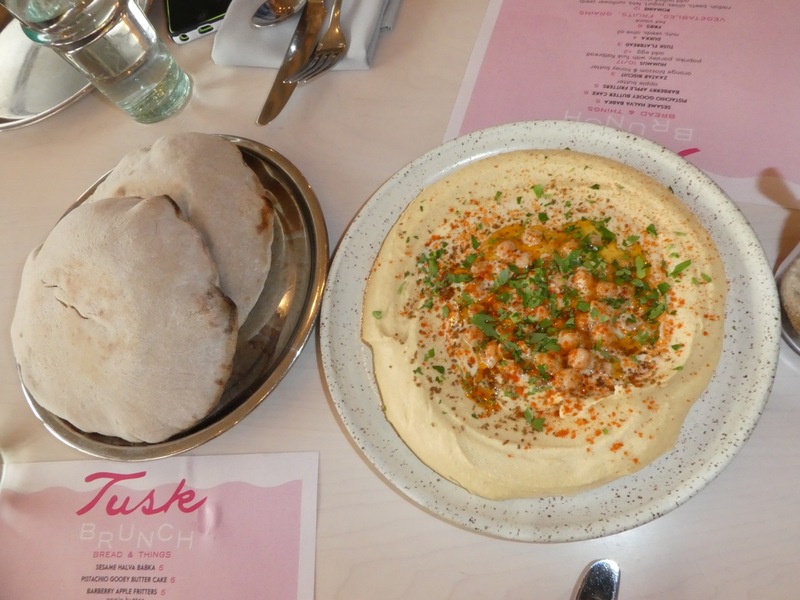 Tusk is a Middle Eastern food restaurant in East Portland that also serves brunch. My family hardly had to wait at all, and we were quickly seated at a table for four. Their brunch menu is slightly smaller than that of Screen Door, but it was tasty and unique. We decided to order a couple of appetizers, including the hummus plate. Everybody ate quite a lot leading up to our actual brunch. There was plenty of time for me to admire the neat decorations of the restaurant, and peer around to see what other people had ordered. I had ordered yet another biscuit based meal, the biscuits and gravy. My mother ordered a grain bowl, that she claims was delicious. I was satisfied yet again with brunch in Portland. The biscuits and gravy turned out to be a pretty good choice. The first time we ate brunch at Hunny Milk, it was merely a small pop up within another restaurant. It was close to Screen Door and Tusk. It hadn’t really been discovered yet, and there was practically nobody there. Each item on the menu sounded fantastic, and we quickly found out that they were, indeed, fantastic. Each tray held a beautiful, delicious food that each of us would happily eat time and time again. 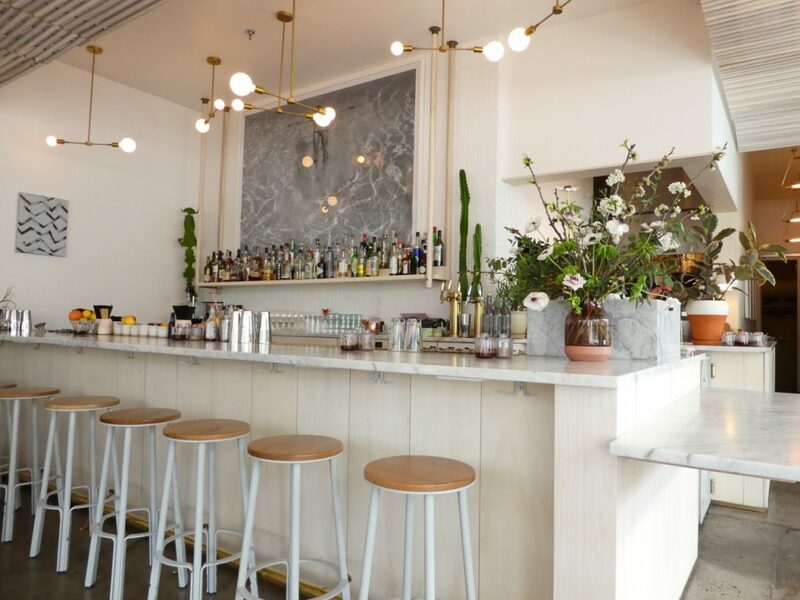 Now, Hunny Milk has been recognized by citizens as a wonderful place to eat brunch in Portland. There is now an actual Hunny Milk restaurant, as well as the pop up. We decided to eat at their new restaurant near Downtown Portland this time. The new Hunny Milk has a nice and comfortable waiting area. It is quite large, with multiple squishy couches, bean bag chairs, books, magazines, and board games. All of this seemed great, until an hour and a half passed by. Remembering that the staff had told us the wait would only be forty-five minutes, my mother asked how much longer the wait would be. This time, the employee said that it should be another thirty minutes. At this point, my family felt as if we couldn’t give up on brunch because we had already waited so long. Finally, we got a table. Two and a half hours had passed since we arrived. We ordered quickly; biscuits with chorizo gravy for everyone, a couple of funnel cakes, a waffle, and a crepe. Excited for our food, we sat in our booth and waited some more. A whole hour passed before we were finally greeted with the satisfactory smells of biscuits, gravy, and funnel cake. The food looked great, smelled great, and tasted even better. This did not make us any less bothered by the absolutely insane total wait time of three and half hours. It did fill our empty stomachs that hadn’t been tended to all day. After that painful wait, I got to eat the best biscuits and gravy I’ve ever had, plus a fantastic gourmet funnel cake. I still can’t decide if it was worth it, but I do know that Hunny Milk needs to optimize their staff and dining space. In the end, our food from Hunny Milk was some of the best I’ve ever consumed. Yes, the wait time crushed our Sunday brunch excitement quite a bit, but we stayed strong and had patience. I think it’s safe to say we’ve become true Portlanders at this point. Perhaps brunch in Portland isn’t to die for, or to wait several hours for, but that’s just how things worked out. Headwaters is yet another great place to eat brunch in Portland, Oregon. Located within the luxurious Heathman Hotel, Headwaters has a spectacular brunch menu. 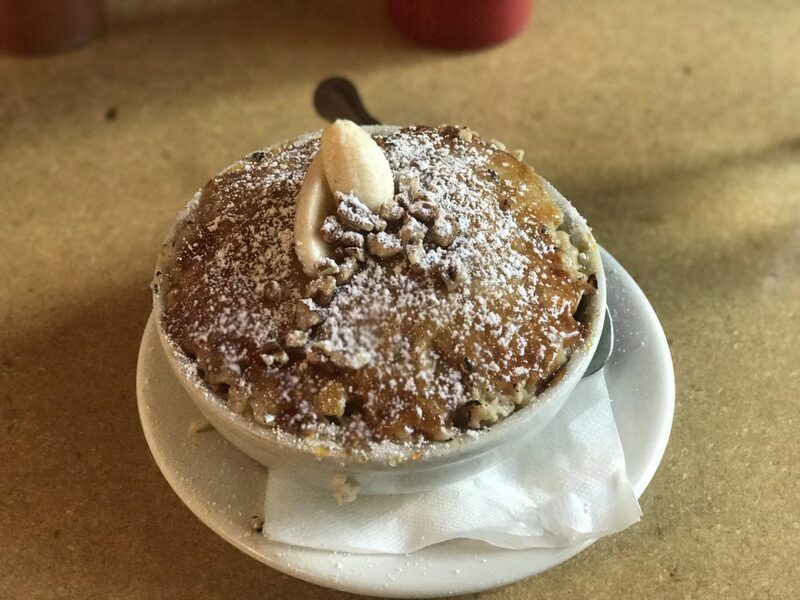 With all sorts of different options, french toast, pancakes, smoked fish, and egg dishes, you’re guaranteed to find a meal you’ll enjoy. I myself ordered huckleberry pancakes and my brothers ordered the french toast. Although my meal was great, I couldn’t help but grab a few bites of what was left of the french toast. 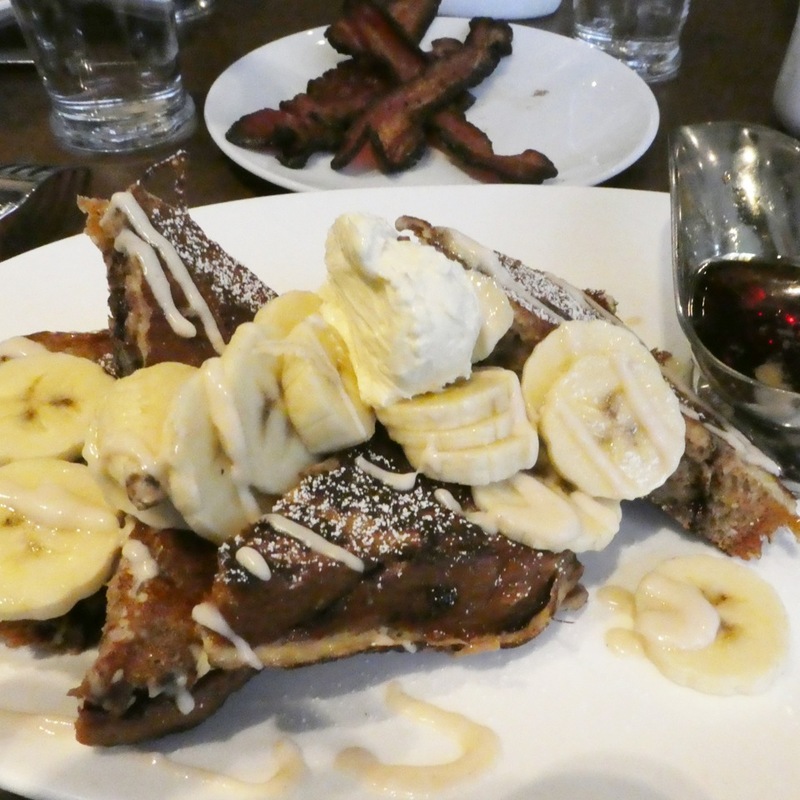 It was an appetizing plate of french toast, syrup, whipped cream, bananas, and candied pecans. Often times I don’t go for french toast, for I am a much larger fan of pancakes when it come to breakfast/brunch food. Even though it’s out of the ordinary for me, I would definitely go for the french toast, if we returned to Headwaters. 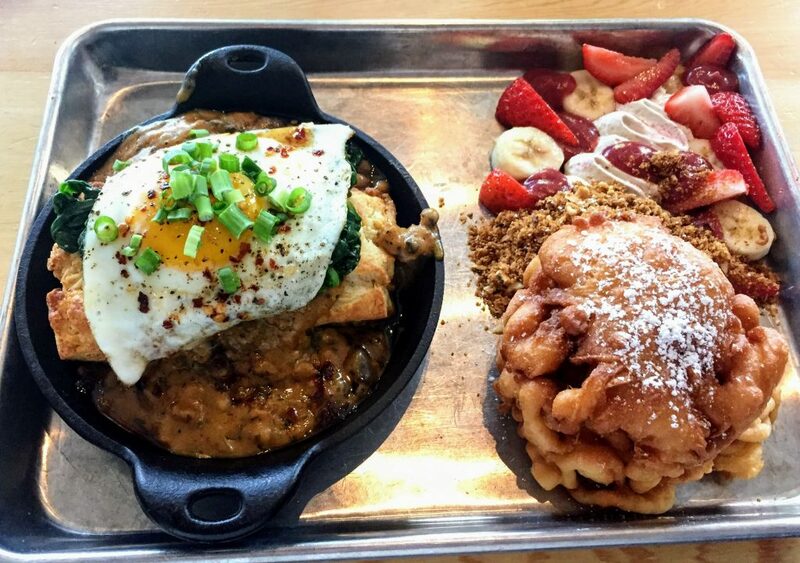 Gravy is another great place to eat brunch in Portland. I’ve eaten there twice, both times due to hospital visits. The first time, I was getting a cast for my hand. We ended up at the hospital a while later for my brother. Although both brunch dates were a result of slightly bad occurrences, they were highly enjoyable. Because the hospital we ended up at was in Portland, my mother and I decided to get brunch after the appointment. We hadn’t really tried a lot of the brunch in this particular area, so we walked down the street and gave Gravy a try. Gravy is a cute brunch place with some interesting artwork and rustic decor. By interesting, I mean weird paintings of caricatures and other such art. Mom ordered an appetizer of oatmeal, as well as an order of the chili verde. I was less adventurous with my taste in food at that time, and went with a stack of pancakes. Although rather boring in comparison to the great number of other wonderful foods, the pancakes were actually quite good, possibly some of the best I’ve ever eaten. Mom enjoyed her chili verde, and I even stole a few bites because it looked so good. Beeswing is located in Northeast Portland. I ate here for the first time with my father and my grandparents, as well as my brothers. We entered the brunch spot to see walls decorated with pieces of newspaper. It was a quirk of the restaurant that my family and I enjoyed. It was interesting getting to read all kinds of old newspapers. I remember one of them was advertising elevators, because they were the cool new thing at the time. There was another paper advertising cars with auto transmission, from a year when auto transmission had just been developed. Although there was a small line when we arrived, it moved quickly. Everybody ordered at the counter; half the family chose the breakfast enchilada. I ordered one of the breakfast sandwiches, which was actually quite good. My brothers and I grabbed waters for everyone, and we talked about brunch and the newspapers on the walls. My older brother, Noah, was very happy with his breakfast enchilada. So was Dad and Grandpa. I was surprised when Noah told me that it was the best breakfast food he’d ever eaten. Considering my brother is not a very vocal person, that must have been one excellent enchilada. If we were to brunch here again, I’d definitely get what Noah had. After all of these spectacular brunch experiences, I have no doubt in my mind that Portland brunch is worth the try. The food is delightful every time. Yes, wait times can be a pain, but if you book a reservation or arrive early enough, they aren’t so bad. If not, stick it out like a true Portlander. Pricing for most of these places is logical, considering the high quality of food. It’s all worth it, for the most part. Maybe don’t wait four hours for brunch in Portland, but forty-five minutes to an hour pass by faster than you’d think. 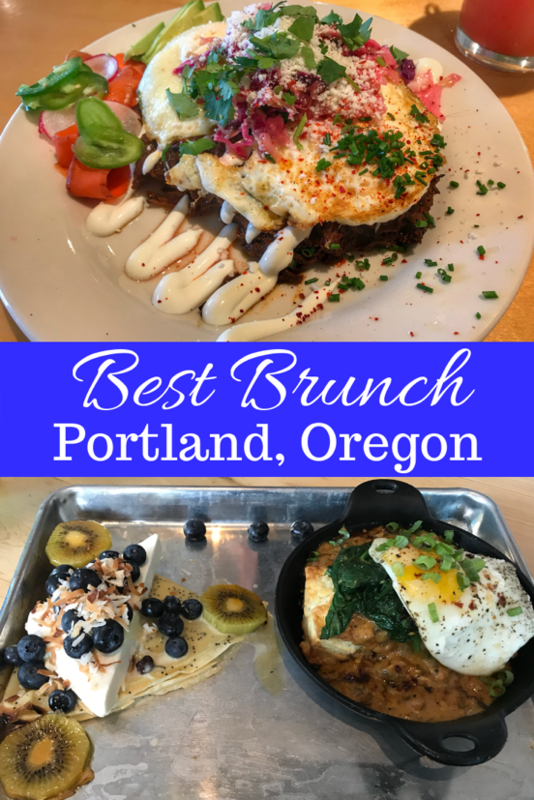 Clearly, there are plenty of places to eat brunch in Portland that I haven’t mentioned, but the brunch spots I’ve listed have some of the best food I’ve eaten in my life. People visiting Portland should definitely give these restaurants a try. In fact, try any brunch in Portland at all. Whatever you order, I’m sure it’ll be delicious, as food is often an experience in Portland, Oregon. That is some great writing, Eden! I’m getting hungry.